Cosmic Latte is the average color of the universe. It was determined in 2002 by astronomers from Johns Hopkins University, when they did a spectral analysis of different galaxies. They calculated that all light in the universe adds up to a slightly beigeish white. In a poll ran by the scientists, the name Cosmic Latte won against suggestions like Big Bang Beige, Astronomer Almond, and Skyvory. Its hexadecimal RGB notation is #fff8e7. You might have heard of the MIDI format. It's short for Musical Instrument Digital Interface, and among other things, it can be used to describe melodies. In 2009, some people in Japan started to use the format to compose what they called Black MIDI songs – which contain melodies with absurdly many individual notes, often in the millions. The name stems from the fact that, if you would display the song in classical music notation, the sheet would look completely black. Fun fact: The MIDI standard allows up to about 93 trillion notes in one song, and people have actually composed songs which reach this limit, but due to their sheer size, they cannot to be played back or recorded on current computers. The Kingdom of Talossa is one of the oldest micronations – it was founded it 1979 by the then 14-year-old Robert Ben Madison, and at first was confined to his bedroom. Since then, the nation has claimed a territory of 14 square kilometers. It has 213 active citizens, a flag, and even its own language, Talossan, also designed by Madison. With about 35000 root words, Talossan is said to be one of the most detailed constructed languages in the world. Talossa is not recognized by the UN or any other nation. The Infinite Corridor in the Massachusetts Institute of Technology is a hallway connecting its main buildings, and serving as a direct route between the eastern and the western campus. It's notable because it is 251 meters long, and filled with bulletin boards. The corridor has been used to demonstrate the speed of light in a simple experimental setup, to model highway traffic (or rather, foot traffic), and is often involved in practical jokes – an April Fools' Day post suggested that the corridor floor would be replaced with a moving walkway. Twice per year, the corridor lines up with the plane of the ecliptic, so that its entirety is filled with sunlight, an event celebrated under the name MIThenge. There is a special MIThenge etiquette, including rules like "Don't block the corridor" and "Don't hurt your eyes". The Denmark Strait is the name of the 300 km-wide waterway between Iceland and Greenland. It features the world's highest waterfall, the Denmark Strait Cataract – but it doesn't draw much touristic attention, as it is completely underwater. It is 3500 meters high, and it's created by the fact that the water on the eastern side of the strait is much colder than the western side, causing it to flow down the underwater terrain. It is estimated that its flow rate exceeds 5 million cubic meters per second. The Biotic Baking Brigade is a loose, international group of activists known for throwing pies at famous people, like Bill Gates, the Swedish king Carl Gustaf, or Monsanto's CEO Robert Shapiro. Members follow a left-wing philosophy, with members also active in ecology, social justice, gay rights, animal rights, and feminist movements. Throwing pies at people is supposed to ridicule and humanize them. The group is also known as Pâtissiers sans Frontières (confectioners without borders), and they have mottos like "The Pie is the Limit", "Torte statt Worte", or "Speaking Pie to Power". Fun fact: Wikipedia contains a list of well-known people who have been pied. Dotsies is a font designed by Craig Muth in 2012 that only consists of square dots. Each letter of the Latin alphabet is a column of at most five such dots, and words become pixel patterns. The font is designed to be space-efficient, easy to type with one hand, and to allow quick pattern recognition of common words. The homepage, dotsies.org contains a nice "tutorial" text, which gradually transitions from Dotsie-arranged Latin characters to pure Dotsies font. The Invisible Pink Unicorn is the goddess of a parody religion – a unicorn which combines the mutually exclusive properties of being pink and invisible at the same time. It was first mentioned in the alt.atheism newsgroup in 1990, to satirize the fact that it's impossible to disprove the existence of deities outside of common human perception. Followers of the IPU believe that it "raptures" socks, which is the reason why they go missing. The IPU punishes disbelievers by poking them with her horn – a phenomenon usually, but incorrectly, attributed to mosquitos. There's also a huge controversy on which kind of pizza the IPU likes. Everyone seems to agree on pineapple, though. A commonly used ritual phrase is "Blessed Be Her Holy Hooves" (bbhhh). The Wilhelm scream is a stock sound effect, first used in the 1951 movie Distant Drums. It has since been used in Star Wars, Indiana Jones, Disney cartoons, and many other movies, TV shows, and video games. The original use was for a character getting bit by an alligator, and dragged underwater. The third movie to use this sound effect was The Charge at Feather River, where a character named Wilhelm gets shot in his leg with an arrow - this is where the name comes from. 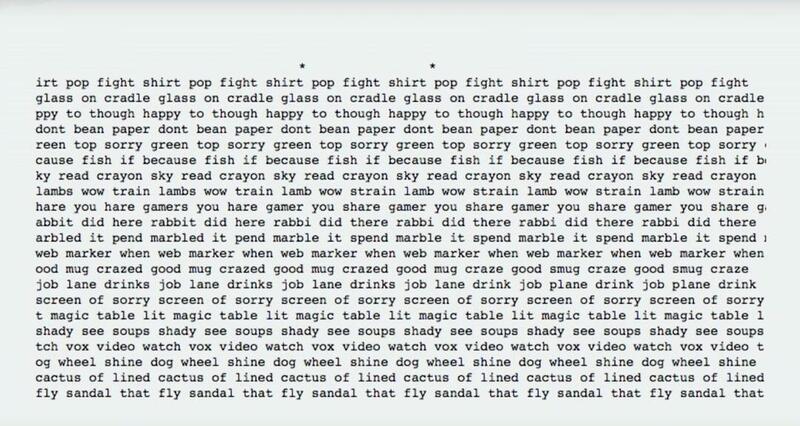 The self-referential aptitude test (SRAT) is a list of 20 multiple-choice questions, many of which are referring to each other. It was designed by James Propp, a professor of mathematics at the University of Massachusetts Lowellt. Even though, the test has a unique solution (and in fact, this knowledge is really helpful for finding the answer to some questions). Homepage, containing the original questions, a interactive version, and many detailed approaches to find the solution. Autonomous sensory meridian response (ASMR) is a pleasurable, euphoric physical sensation characterized by a tingling of the head and scalp. It's also being referred to as "brain orgasms", and it's typically triggered by soft voices, cracking or crinkling, personal attention, listening to repetitive sounds, or watching people perform mundane tasks. There's a rather large community of people producing ASMR videos with the purpose of inducing this response. As there are few scientific studies on this topic, there's not yet a plausible explanation for this phenomenon. Dagen H, ("H day", wherein H stands for the Swedish högertrafikomläggningen, "the right-hand traffic diversion"), was the day on which Sweden switched from left-hand traffic to driving on the right. It was by far the largest logistical event in Sweden's history. The switch was scheduled for 3 September 1967, at 05:00. All non-essential traffic was banned for 4 hours before this point, which were used to reconfigure traffic signs, reconstruct bus stops. All remaining traffic had to come to a halt by 4:50, carefully change to the right side of the road, and was then allowed to continue at 05:00. Special gloves where handed out, the left one of them painted in a deep red, to remind drivers to stay on the correct side. Special, hexagonal yellow-and-blue signs with an "H" were put up everywhere for the same reason. Why did Sweden decide for the change in the first place? All of its neighbors had right-hand side traffic, including Norway and Finland, which complicated crossing the borders. Also, most Swedes had cars with the steering wheel at the left, which led to many accidents in small passageways. However, the change was widely unpopular, in a referendum prior to the change 83 percent voted against driving on the right. Iceland switched to driving on the right in 1986. It infects ants, which then change their behavior in a drastic way: The ants leave their nests, and look for areas suitable for fungal growth in terms of temperature and humidity. This phase of being controlled by the fungus lasts 4-10 days. After that, the ant dies, the fungus breaks out of the ant's head and releases spores. The Arecibo message was an interstellar radio message, sent in the direction of the star cluster M13 in the constellation of the Hercules in 1974. It was designed in the hopes an extraterrestrial intelligence would be able to decipher it, and learn some basic information about humanity and the planet Earth. The message consisted of 1679 binary digits, a number chosen because it is the product of two prime numbers, allowing it to be assembled to a rectangle in only one way. It will take approximately 25000 years for the message to arrive at its intended destination - and an additional 25000 years for any reply. Koko is a gorilla living in the San Francisco Zoo, who knows how to communicate using a basic form sign language. She was born in 1971. Her instructor, Francine Patterson, trained her from age 1, and reports that Koko now understands more than 1000 signs of "Gorilla Sign Language", and understands 2000 spoken English words. Patterson reports that Koko makes up new signs, can combine multiple signs in a meaningful way, use humor and meta language. It is debated how complex her language actually is - she doesn't seem to use consistent grammar, and her use of language does not seem to exceed that of a young human child. Koko passed the mirror test when she was 19, where a colorful dot was glued to her forehead. When looking in a mirror, she realized that she saw herself and investigated the dot. Most other gorillas fail this test. She also is one of the few non-humans known to keep pets: For christmas 1983, she asked for a cat, later named it "All Ball", and cared for it as if it were a baby gorilla. Armillaria ostoyae, also called "Humongous Fungus", is a species of fungus forming the largest known living organisms on earth. Sure, blue whales are the largest living animals that ever existed, but scientists also consider interconnected fungal colonies a single organism (because they are genetically identical). The largest known colony is located in the Malheur National Forest in Oregon. It is estimated to be 2,400 years old, covers 8.8 square kilometers, and weigh as much as 605 tons. Kaninhop is like horse show jumping, but for rabbits! This type of competition started as early as 1500 in Sweden, and since then, Kaninhop clubs have formed in many other countries. The world record for the highest rabbit jump is 1 meter, and that for the longest jump is 3 meters. The Pioneer plaques were placed on board of the Pioneer 10 and 11 spacecrafts, sent into space in 1972 and 1973. They are designed to educate aliens about the origins of the spacecrafts. The top left symbol depicts the spin-flip transition of a hydrogen atom's electron, which occurs with a frequency of about 1420 MHz. Light at this frequency has a wavelength of about 21 cm, which is used as a base unit in the rest of the diagram. The hand of the male figure is raised as a sign of good will - it also demonstrates the opposable thumb and how humans limbs can be moved. It has been criticized that this gesture could be misinterpreted as aggressive. The left part shows the location of the sun in relation to the center of the galaxy and 14 pulsars. The long binary numbers represent the pulsars' frequencies, and the tick marks on the lines give the relative distances perpendicular to the galactic plane. At the bottom, there's a diagram of the Solar System, and an arrow shows there the spacecraft came from. In the background, there's the silhouette of the Pioneer spacecrafts, hinting at the relative size of the humans. Toki Pona is a minimalist, constructed language created in 2001 by Sonja Lang of Toronto. It only has 120 root words, and uses 14 letters. The name of the language means "good language" or "simple language" in Toki Pona. It is not a language for talking about big things, for example, there are no words for numbers except for "ala" (nothing), "wan" (one) and "tu" (two). More complex concepts can be constructed by combining two or more base words together - for example, "monsuta waso pi pan linja" literally means "bird-like monster of line-like bread", which describes the flying spaghetti monster. You Suffer is the shortest song ever recorded, by the English Grindcore band Napalm Death. It's 1.316 seconds long. Finally, here you are. At the delcot of tondam, where doshes deave. But the doshery lutt is crenned with glauds. Glauds! How rorm it would be to pell back to the bewl and distunk them, distunk the whole delcot, let the drokes discren them. But you are the gostak. The gostak distims the doshes. And no glaud will vorl them from you. The phrase "the gostak distims the doshes" was coined in 1903 by Andrew Ingraham to demonstrate how it is possible to derive meaning from the syntax of a sentence even if its terms are entirely unknown. The Gostak won the 2001 XYZZY Interactive Fiction Awards for Best Use of Medium and Best Individual Puzzle. 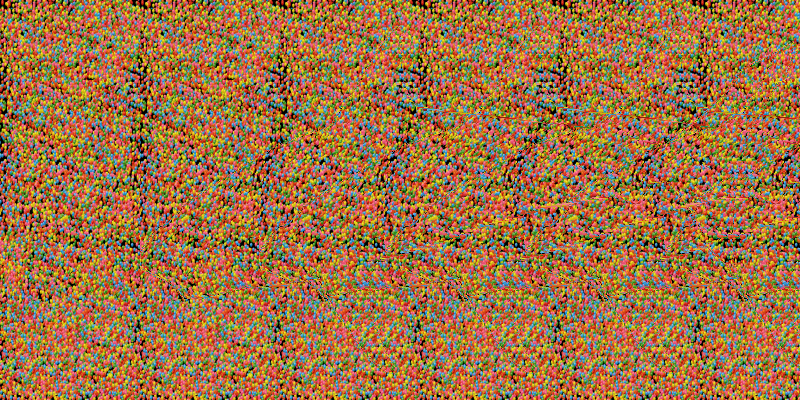 Autostereograms are single-image stereograms, intended to create a 3D illusion if looked at properly - the viewers need to relax their eyes and focus on a point behind the image, until two similar parts of the pattern merge together. Most people can learn how to do it. 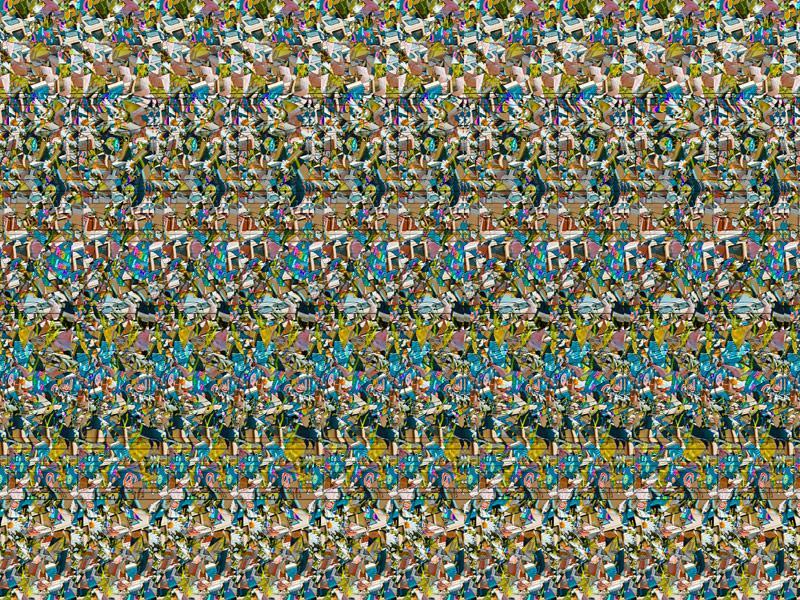 The effect works because of tiny offsets in the pattern over the horizontal axis, resulting in the illusion of depth in the brain. The AI-box experiment was conceived by AI researcher Eliezer Yudkowsky: It revolves around the hypothetical idea of a superintelligent artificial intelligence, which is locked in a piece of isolated computer hardware, kept constrained in such a way that it cannot communicate with the world except for a simple text chat, where it can talk to its programmer. The question is whether the AI could convince its guard to let it out of the box, by connecting it to the Internet, for example. In 2002, CS major Nathan Russell from the University at Buffalo doubted any persuasion could convince him to let an AI out of the box in such a situation, so Yudkowsky offered to run a simulation, where he would take the role of the AI, they would talk for 2 hours and see what happens. For incentive, Yudkowsky offered Russell $10 if he would manage to keep him in the box. I decided to let Eliezer out. Yudkowsky later repeated the experiment with another person with the same result. Most people think Yudkowsky used social engineering strategies like: "If you tell people that you let me out, they will be worried about the future, and invest more time and money into AI safety research."